Two choices in the pavlova! How people choose to spend Jan 26th across the Peninsular is as diverse as our community. Chilling at home enjoying a day off work, supporting the first people of Australia by attending the Yabun festival, heading to the beach for a swim, taking a paddle or sail on Pittwater, attending any one of a number of local events or hosting one of their own. Getting the kids up early for a swim at the ocean pool, we saw families setting up for a day by the water with marquees, tents, picnics and fishing gear. There was a guy in the car park playing a ukulele, people walking their dogs, paddle boarders, surfers, swimmers, runners … After a refreshing swim we headed over to a really special BBQ at Elanora Heights. Our host, Tony, originally from the UK, received his citizenship at Newport Beach on Jan 26th 2 years ago. He lives with his wife and 4 kids on the site of what was once called Merridong Dairy. A small part of the original structure is preserved in their home today. Tony has been learning to make cheese for some time and has pretty much mastered it. We often joke about him continuing the heritage of the dairy by becoming the Merridong Cheesemaker in Residence. A few years ago his Aussie primary school teacher brother in law volunteered to help in a refugee clearing centre in Greece over the Christmas holidays returning with some heartbreaking stories. Tony decided to fundraise to help these refugees by auctioning off some home made cheese. This led to a number of local connections and Tony and his family are now helping a Syrian refugee family to resettle in Australia as part of The Northern Beaches Refugee Initiative (NBRI). 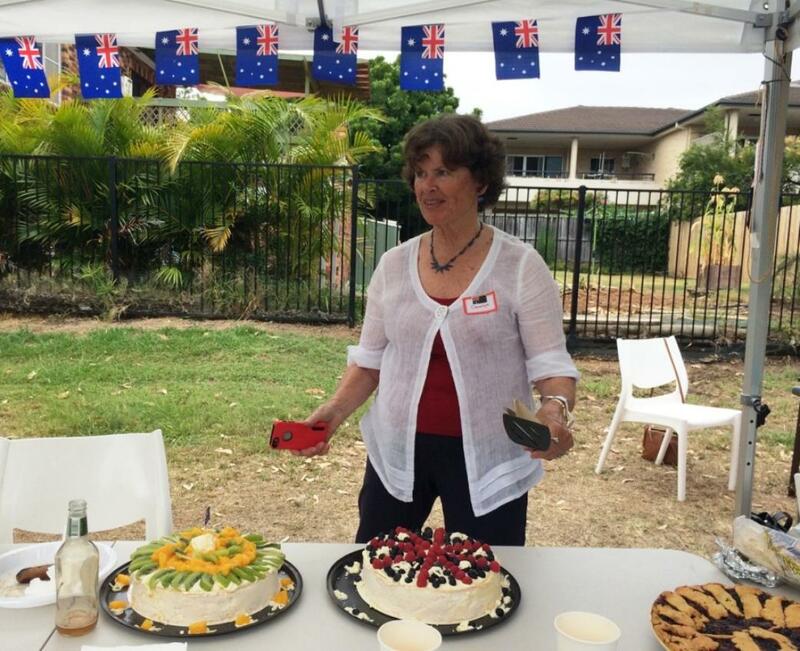 This Australia Day we celebrated with some of the amazing people who have brought this project together – they are Australians with Polish, American, German, Syrian, Armenian, British and European backgrounds, some who have arrived as, or were children of, refugees themselves. Tony BBQ’d some of his stunning home made Merridong Haloumi cheese, his neighbours slow cooked the most tender lamb I have ever tasted, and we learnt some great Armenian and Syrian BBQ tips – including using a hair-drier to get the coals hotter, faster and lining your serving plates with flat bread to soak up all the meat juices. Whilst kids repeatedly launched themselves down a giant slip’n’slide made of sand bags and builders plastic in the park, the pizza oven was fired up and a united nations of volunteers production lined a variety of toppings into a tasty array of toasted treats. Our new Premier sent her well wishes in a letter outlining how lucky we are to live in a tolerant and welcoming country where anyone can aspire to succeed through hard work and persistence. As Tony read out this message, echoed by a translator for the benefit of many of the audience, it drove home just how diverse and hard working our the local community is. So many so happy to have become Australians or that their parents or grandparents did. Its fantastic to know that within our community there are people helping others who, despite the hardships they have endured on the way, see a bright future for their families here too. NBRI is a group of people from churches on Sydney's northern beaches who have expressed a keen interest in supporting Syrian refugees arriving in Australia under the federal government's special program. You can find more information about this great program here if you are interested in helping https://www.facebook.com/refugee.initiative.northern.beaches.churches/ or you can contact rinbc@ststephens.net.au. Article and Pictures by Selena Griffith, 2017.